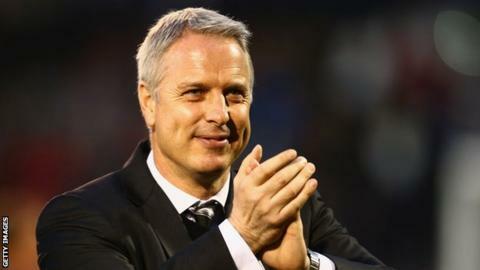 Fulham manager Kit Symons believes their Championship opener against Cardiff City on Saturday will be a meeting of two promotion contenders. Both sides ended last season in mid-table following relegation from the Premier League the previous campaign. But former Wales assistant manager Symons believes the two sides are candidates for promotion this time. "That's our aim now. We're very optimistic that promotion will be the outcome," he told BBC Wales Sport. "Cardiff certainly can be promotion contenders. I don't see why not at all." Symons left his role as Wales assistant manager in June, having been Chris Coleman's number two since January 2012. "Even with the support of owner Vincent Tan, the affable Slade is in one of the most pressurised jobs in the Championship. The way Cardiff cope with a tough looking opening group of fixtures may give us a decent indication of how much that pressure will build." Former Wales and Fulham centre-back Symons initially combined the role with being Cottagers boss, but was told he had to concentrate fully on his club commitments. The 44-year-old succeeded Felix Magath as Fulham manager on an interim basis in September 2014, taking over permanently a month later. His aim this season is to return the London club to the Premier League. "We've got high hopes and high expectations," he said. "We've had some tough times in recent years but I'm very hopeful of the good times coming back." Cardiff have signed just one senior player over the close season, bringing in striker Sammy Ameobi on a season-long loan from Newcastle United. But Symons added: "It will be a tough one. They're a strong side and it made me smile when the fixtures came out. "I was there a few weeks back, having a fantastic night beating Belgium [with Wales]. "All my family are from Cardiff, so I always look forward to going back."